Hollywood Park was a depression-era track that opened in 1938. Santa Anita which opened in 1934 had been so successful with it's winter meet, there was a need to keep all those good horses here during the spring and summer months too. So many Holywood stars formed the Hollywood Turf Club. The track burned down in 1949 and the meet was held at Santa Anita. Horse racing would prove to be America's number one sport in the form of attendance and horse racing stories sometimes ended up on page one of the newspapers. By 1977 Hollywood Park was America's number one track in attendance and handle (betting) with an average of 35,000 fans daily. Also in 1977, Seattle Slew, the undefeated Triple Crown winner was lured out west for the $400,000 Swaps Stakes. Slew had only 3 weeks rest from his grueling Belmont Stakes win and showed it by losing to J. O. Tobin. Slew didn't even hit the board. Nearly 80,000 attended. Hollywood Park expanded it's track to a mile and an eigth to accomodate the first Breeders' Cup day in 1984. By the mid-1980's, horse racing attendance began to decline, first due to off-track betting. Fans were now allowed to bet at their local racetrack instead of driving accross town to the live track. Suddenly grandstands were half full and with the advent of Internet and telephone betting, it became more convenient NOT to go to the track. A decline in the neighborhood surrounding Hollywood also led to further drops in attendance. Hollywood's Spring/Summer meet is not averageing less than 5,000. In 2009 the Inglewood city council approved the zoning of Hollywood Park into a commercial and residential development, meaning horse racing is over at this glorious facility. The only thing saving Hollywood Park from the wrecking ball is the recession. As soon as financing is found, Hollywood Park will be no more. Until then, they are conducting race meets like nothing is going on behind the scenes. The current owners are the former owners of Bay Meadows, a track that once graced the San Francisco Bay area for decades, only to be closed down for development, the same that is being proposed for Hollywood Park. As Zenyatta fever stuck in 2010, she was visited by thousands of fans at ther stall at Hollywood Park. It would be outrageous for horse racing to just stand by unconcerned with the future of two of it's biggest stars of the past, both Zenyatta AND Hollywood Park. The wrecking ball hit Bay Meadows grandstand within hours of it's final race. These operators act fast in case people get cold feet. And if you are interested in visiting this grand old lady, let me know, I am thinking of getting a small group together during the Breeders' Cup and paying Hollywood Park a visit in the morning. Perhaps we can see Zenyatta's old haunts and top it off with a drive through Beverly Hills and Hollywood. I know Los Angeles very well and will keep you in safe areas. The real estate market will not support the kind of redevelopment envisioned for Hollywood Park for a long, long time. California as a whole is a failing enterprise, with businesses fleeing in droves and the government entertaining plans, in its infinite wisdom, to curtail new development. Add to that the fact that the neighborhood is, to put it politely, a hellhole, and you've got a recipe for racing at the site for the foreseeable future, I would think. Nobody wants to open a business in that part of town, and I can't imagine anyone in their right mind wanting to live there, especially when you consider the jumbo jets passing a couple hundred feet over head 24/7. Laurie I both agree and disagree with you. You summed the economic climate correctly but I was there for the last day of Bay Meadows, and they tore it down almost immediately after the last race. Operating the race track is making them a small profit, but the development will make them much more even if the profits are downgraded by the depressed real-estate market. These people think dollar signs, nothing else. If fact, after destroying Bay Meadows, the rubbage sat there for months as the economy had slowed the rush to development there. The name of the ownership in both cases is: Bay Meadows LAND Company, not Bay Meadows Race Track, etc. I'm hoping your analysis is correct, but would like to defend the track in case it is not. There's too much history there to just let it go. I'm hoping concerned Zenyatta and racing enthusiasts will get involved. Mark, interested in what you and the other folk have to say about the current state of your racetracks. Even here in Australia, changes are taking place at some of our tracks - notably in Sydney as pressure grows for more development that has forced, for example, greyhound racing to relocate. While attendances are still reasonable, racing administrators are concerned that even at major events they are not what they used to be. One of the reasons for this is a rise in on-line betting, which I find very sad. I went to my first race meeting here in Canberra a few weeks ago, and just LOVED the whole experience. I didn't bet, but was just entranced to see and hear the equine athletes perform - and the track here is just so close to the horses. One little incident that just tickled me was hearing a tiny little female strapper talking to her charge as they left the track - she said "Don't worry, you did your best, and there's always another race coming up". But watch those developers very closely! Good luck in your fight! Kathy, you Australians take very good care of your horses. Notice that they sometimes race once a week. Not in the states, it's at least once a month for various reasons that I just don't want to get into. We here in California are allowed to bet on some Austrailian races. I admire the beautiful courses and notice thet the grandstands have grass for the fans to stand on, our tracks have concrete. In Los Angeles, because of the horrendous freeway conditions, the off-track betting is actually the way to go. Horse racing would be in even more dire straits without it. But the biggest danger to the sport of kings is casino gambling. Just 25 years ago, the only states that had casinos were Nevada on the west coast and Atlantic City on the east coast. Now, virtually every state has some form of casino gambling. Not only has that hurt the horse business, it's taken it's toll on Nevada and Atlantic City. Some race tracks have married the casinos in the form of a "Racino". Like many marriages, the divorce papers are just around the corner. For example: Canada had slots at nearly all race tracks with a portion of the slot profits going to the horsemen in the form of purses. But the Canadian has announced the marriage is over. They can't afford to subsidize horse racing any more with government deficits looming. The state of Pennsylvania has already announced they want a bigger slice of the slot money going to purses. And, you know what? I agree that the public money shouldn't be subsidizing this industry or any other. Most of the public could care less about horse racing and we will see this trend continue down the road. Another factor against horse racing is it's huge takeout system. The takeout is the percentage of the total amount taken out of the pool to fund the state, the track operator and the horsemen (purses). The problem is the takeout average is 20%! This is an amount that puts horse racing in an uncompetitive investment amongst gamblers. For example, sports betting has a 4.5% takeout, slots have a 5-10% takeout. It's not hard to see why many horse bettors have left the game. And I've only hit the tip of the iceburg. When California re-legalized horse racing in 1933, Santa Anita came out of the gate fast. There was another Santa Anita that was located just a few furlongs away. This Santa Anita closed down in the 1920's as horse racing was declared illegal. But the "new" Santa Anita would be one of the country's gems. It is the prototype of what a race track should look like. Built with 1930's art-deco architecture, the grandstand hasn't changed much in nearly a century. There were some suttle changes when Frank Stronarch took over, but these changes were for the betterment of the track. For example, the bar in the grandstand near the paddock has been a splendid improvement. And the restaruant hanging from the roof has been a winner too. I'm not too keen on the apron with it's railing and large potted plants. They sometimes block the view of the action. But considering what has happened to Churchill Downs (the piecemealing together more and more luxury suites) and Gulfstream (tearing down the large grandstand and putting in it's place a grandstand so small, there will no longer be Breeders' Cups held there), Santa Anita has the best infrastructure in place to hold the Cup. It is helped by the roomy infield area and, of course, great weather. But there has been drama. First off the dirt main track was changed to an artificial Pro Ride surface in 2007. The track suffered severely when heavy winter rains occured, forcing the cancellation of some days. Although two successful Breeders' Cups were held here, another problem developed when the surface became uneven near the finish line. With the east coast announcing their dislike for the synthetic California tracks (they have NEVER said the same things about their beloved Keeneland track also with a synthetic surface), Santa Anita was granted permission to return to a dirt surface a couple of years ago. The new dirt strip played very fast; maidens going six furlongs in 1:08 and change was just too fast. A higher occurance of breakdowns also occured. This led management to put more sand in the surface. Hopefully with the upcoming fall meet, there will be slower times and a safer surface. The "fall meet" was the other bugaboo. Oak Tree had conducted the fall meet at Santa Anita for over 40 years. All Breeders' Cups at Santa Anita were held under Oak Tree's management, not Santa Anita's. But Santa Anita, through bankrupcy was allowed to dismiss the Oak Tree meet and take over the fall meeting itself. Oak Tree has announced it isn't done yet. When the track surface failed at Santa Anita in 2010, the Oak Tree meet was held at Hollywood Park. Oak Tree is now flirting with Del Mar to conduct a fall meet there, which could also land that track it's first Breeders' Cup. In the meantime, if you're coming out to the Breeders' Cup this fall, the average tempature for Los Angeles at that time of the year is 65 degrees. However, it could get an early rain or it could get Santa Ana winds that blow the opposite way of normal. The Santa Ana's blow from the desert towards the ocean, making it hot and extreme fire danger in the mountains, as well as the hilly areas of Los Angeles. I've been to a couple Breeders' Cups at 'Anita where the tempature was in the 90's. I think the desire is there to pull a Bay Meadows at Hollywood Park, but they can't, because a) the economics conditions are different today, b) I would wager it's a different type of neighborhood. There's no large scale development going on anywhere in SoCal anymore, and that's in nice areas. The construction industry is in free-fall because of the collapse of both the residential and commercial real estate market. If anything, the commercial market is in worse shape. That's why Betfair got a 5-year contract to operate the place. I'm not saying it won't be torn down sometime down the road, but that time is not now. Stronach's killing of Oak Tree was heartbreaking. Oak Tree was a non-profit that donated hundreds of thousands of dollars to racing charities, and charities in and around Arcadia. I'm guessing he couldn't handle that last bit of BC glory that they received, nor the talked-about offer of semi-permanently hosting the event. Those racing days on the calendar have always belonged to Santa Anita, and I'd be surprised if any other track got a piece of that action, even Del Mar. Last year, they gave SA all of the old Oak Tree dates, declining to give them to Hollywood Park so it could actually run the Oak Tree meet there. I do think Oak Tree is dead, and that's a sad, sad state of affairs. Oaklawn's beginnings go back to 1905. A troubled start, mired Oaklawn. It didn't become a serious track until 1936 with the first Arkansas Derby. After WW2, Oaklawn became one of America's leading tracks in the form of attendance and profitability. While the 1980's saw the beginning of declines for horse racing, Oaklawn has steadily maintained it's fan base. The competition of casino gambling first led Oaklawn to install instant racing machines, where fans could bet on historic races from the past on slot-machine-like devices. Then Oaklawn installed full-scale slot machines to help the horsemen. Oaklawn hasn't fallen victim of the corporate nature of some big tracks. It is family owned and plans to stay that way. Charles J. Cella keeps the track competitive and it's RACING FESTIVAL OF THE SOUTH that includes these stakes: Oaklawn Hancicap, Fantasy Stakes, Count Fleet Sprint Stakes, Apple Blossom and Arkansas Derby. These stakes have attracted some of the biggest talent in America. Zenyatta, Smarty Jones, Ginger Punch, Azeri are amongs the many stars who have visited the famous oval. And the crowd for the Arkansas Derby is the biggest non-Triple Crown or non-Breeders' Cup crowd, usually over 60,000. DEL MAR, COOL AS EVER! Question: Where can you go in August and find 75 degree weather every day? Answer: Del Mar, Cool As Ever. It also comes with a refreshing sea breeze that makes it feel like air conditioning. 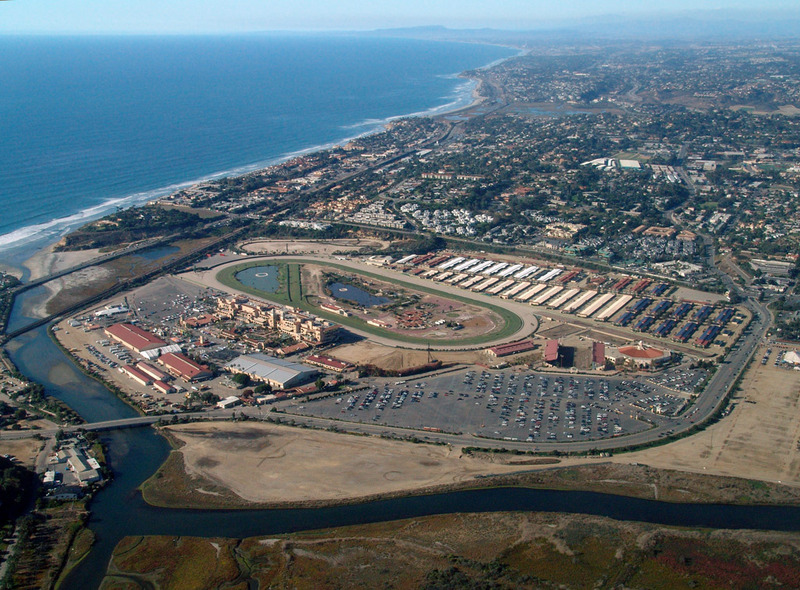 Del Mar began in 1937 as southern California's third track, but today it's the leader. 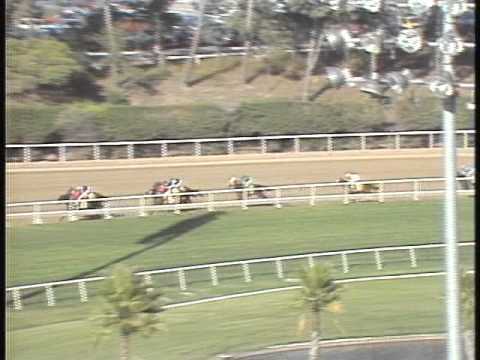 The reason is that it has a short meet, about 40 days and is the only horse racing in San Diego all year. Short meets have proven to be king. This meet rivals the east coast's Saratoga and they run at the same time each year, mid-summer. Cigar came to town in the 1990's with a 16-race winning streak. The track was jammed, but Cigar was done in by a speed duel and finished 2nd. Zenyatta won 3 consecutive Clement L Hirsch Stakes here. Del Mar's old grandstand was torn down and a modern building took it's place. It has all the anemities and great views of the races. I personally find the upper deck, which hugs the track and gives great views of the Pacific Ocean my favorite place to watch a race, anywhere. Don't dare call in sick to work on opening day, because you will probably find your boss at the track too. Churchill began in 1875 after a number of Louisville tracks had run their course. Construction of the track costed only $32,000. In the first meet, the Kentucky Derby, Oaks and the Clarke Handicap were all run. Restructuring in 1894 brought the familiar new grandstand with the twin spires. The Kentucky Derby gradually became America's biggest race and led to Churchill Downs' profitibility. The first nationally telecast of the Derby was in 1952. It is at about this time that Churchill went through a maze of new construction and add-ons. It has been described as puzzling by some, as the new rooms and seating areas didn't have a master plan. Nonetheless, today Churchill looks much different than it did before modernization. It usually accomodates crowds of 150,000 on Derby day and is a player in the Breeders' Cup rotation. However, Churchill DOESN'T have an apron area where fans can roam around and watch the races. Instead, it has seating up to the outside rail of the track, making it one of the more expensive places to watch a big race. When I watched Zenyatta win the 2009 Breeders' Cup Classic standing on the track apron near the finish line, it costed me a total of $10, which was the admission price. At Churchill, that same viewing area could cost you in the hundreds of dollars or maybe the thousands of dollars. See the difference? For all it's history and contribution to the sport, Churchill forgot one person: the fan. It's corporate nature of buying up other tracks, many that have slot machines, has put Churchill Downs on the path of profitibility, but horse racing may take a back seat as the one-armed bandits are now the main focus. Sir Barton, 1919; Gallant Fox, 1930; Omaha, 1935; War Admiral, 1937; Whirlaway, 1941; Count Fleet, 1943; Assault, 1946; Citation, 1948; Secretariat, 1973; Seattle Slew, 1977; Affirmed, 1978. The Corporate-ness now has the Kentucky Derby now called: THE KENTUCKY DERBY PRESENTED BY YUM BRANDS. Don't forget to say it in it's proper name tomorrow, or you might end up in county jail. The point here being, this is horse racing's biggest moment, it's biggest opportunity to create new fans, yet Churchill sees it as it's biggest way to make money. It's too bad. I STILL SAY SANTA ANITA AND DEL MAR ARE THE BEST!!!!!! ninja, I agree, but let's be fair to the tracks we have never been to. I started out with Zenyatta's tracks first. Good ones coming up. I agree. The "Yum Brands" thing makes me ill! I saw my first horse race at Churchill Downs way before I was old enough to bet. It was a great place to spend the day (other than Derby week) and you could and still can sit down on the rail. Also, must put in a word for Keeneland. Beautiful and the quality of horse is wonderful. At the fall meet you can see some of the 2 year olds who will be stars the next year. Keeneland is gorgeous, isn't it? Beautiful paddock. And you drive by Calumet on the way in, depending on how you come. I didn't make it to the spring meet this year. but I did last year. It was so cold for April, and it was interesting seeing all the college girls dressed to the nines in their spring outfits, which they had obviously been planning for months. Brrrr. LauraJ, Remember the days of Keeneland in the afternoon and UK football at night? I know what you mean about the spring meet there. The one time I really got cold at the race track was there one year. Had a friend who somehow got a box in the owners area. Sat next to the Hancocks from Claiborne. Nicest people in the world. I bet on their horse and it lost, but what the heck? It was a great experience to meet such down to earth owners.